Bashundhara Group Vice Chairman Safwan Sobhan visits a stall after inaugurating the 3rd PaperTech Expo-2018 organised by Bangladesh Paper Mills Owners’ Association (BPMOA) at International Convention City Bashundhara in the capital on Thursday. Bangladesh is leading the paper industry in Asia by exporting paper abroad after meeting domestic demand, said Bashundhara Group Vice Chairman Safwan Sobhan. Safwan Sobhan termed the paper industry ‘an economic strength’ for development of Bangladesh while addressing an international exposition as the chief guest in the capital on Thursday. 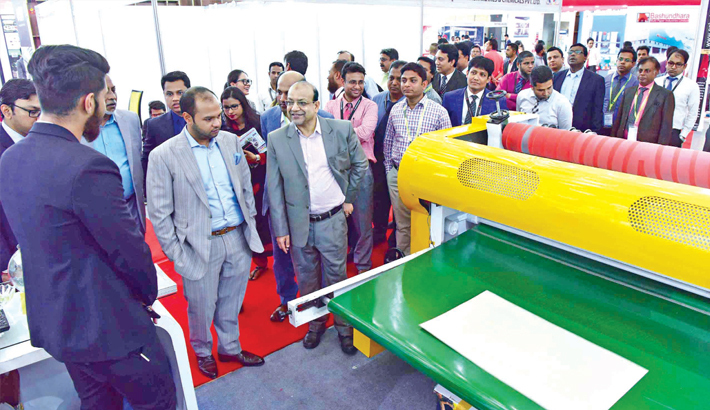 Bangladesh Paper Mills Owners’ Association (BPMOA) organised the three-day exposition styled ‘PaperTech’ for third time at International Convention City Bashundhara in the capital. He thanked organizing committees and the companies from different countries for making the expo success. Paper producers from the United States, India, China, Japan, Korea, Egypt and host Bangladesh installed 150 stands to showcase machines, paper-making mills, paper products, packaging and printing technology. Expo coordinator Syed Mahbubul Alam said the main objective of the exhibition is to create bridges between the manufacturers and traders involved in the paper business in the country. In Bangladesh, around 100 paper mills, including Bashundhara Paper Mills Limited have been producing 6-8 lakh tonnes of papers a year. The local paper manufacturers are exporting a wide range of paper and paper products to more than 30 countries after meeting the local demand. Bangladeshi paper products are being exported to India, Myanmar, Nepal, Bhutan, Pakistan, and many Middle Eastern and African countries.